Tight the nut. Usually hand-tight is good enough to create a water tight seal. You can also use 3/4 in wrench. Do not over-tighten, it could crack the despenser made of fragile material like glass or ceramic. If used for sugary drink, we suggest that remove spigot from the dispener and clean throughly. Package Content: 1 stainless steel spigot, 2 stainless steel washer, 2 silicon gasket, 1 stainless Steel nut. Warranty informaton is provided on the package. SSS020: Classic Design, Good Value. Flow Rate at 7 sec/cup . We are selling spigot with chalkboard labels. FIRST ON AMAZON: Launched on Mar 11, 2014, Stainless Works® is the first brand for stainless steel spigot on Amazon. SOLID 304 STAINLESS STEEL CONSTRUCTION: No Lead, Acid Resistant. 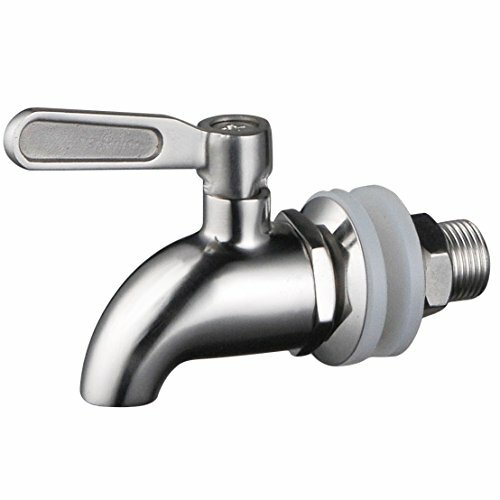 Great for Dispensing Tea, Beverage, Vinegar or Wine.Quarter-Turn Stainless Ball Valve. BEST FLOW RATE: 4 sec/cup. First Picture in Open Position, Turn Right to Close. UNIVERSAL FIT: Needs 5/8 inch or 16mm diameter opening to install. For flat surface, can fit up to 1 inch opening. If you have any questions about this product by Stainless Works, contact us by completing and submitting the form below. If you are looking for a specif part number, please include it with your message.